Allok Video Converter is an All-in-One video converting tool which can convert all video files to AVI, MPEG, WMV, MP4, H264, 3GP, FLV etc. Allok Video Converter includes a powerful media conversion engine internally so that you can convert media files with very fast speed and excellent video quality. With Allok Video Converter you can convert your video files into the formats you need to watch on TV, put on a website, create a presentation, watch on your iPod, iPhone,Apple TV, Xbox, Archos and much more. * Supports AVI, Divx, XviD, MPEG, WMV, ASF, RM, RMVB, MOV, MP4, 3GP, FLV, MKV, MOD. * Supports all video files to AVI, DivX, Xvid. * Supports all video files to MPEG1, MPEG2. * Supports all video files to VCD,SVCD,DVD compatible MPEG formats. * Supports all video files to VCD SVCD image(*.BIN,*.CUE) and DVD-Video files(*.IFO,*.VOB,*.BUP). * Supports all video files to WMV, ASF. * Supports all video files to MP4, H264, 3GP, 3G2. * Supports all video files to iPod, iPhone, Apple TV, PSP, PS3, Xbox, Archos, iRiver etc. 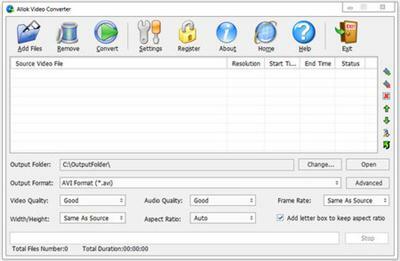 * All encoders/codec are built-in and any supported conversion can be done once you downloading the software. * Cut unwanted parts by specifing start time and end time. * Support "Drag and Drop" from Windows Explorer. * Add letterbox to keep the original aspect ratio. * Fast conversion speeds and high quality.